FIERCE! WATCH OUT! 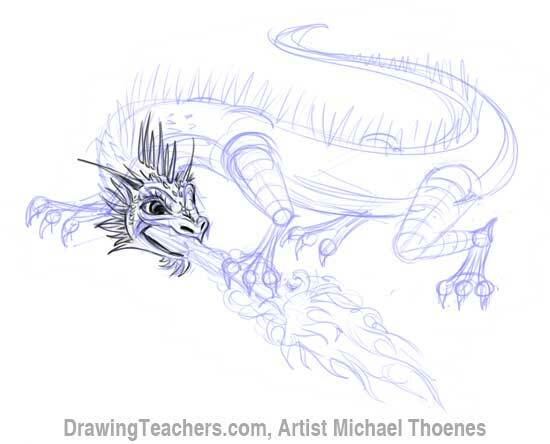 Draw a Dragon Step by Step. 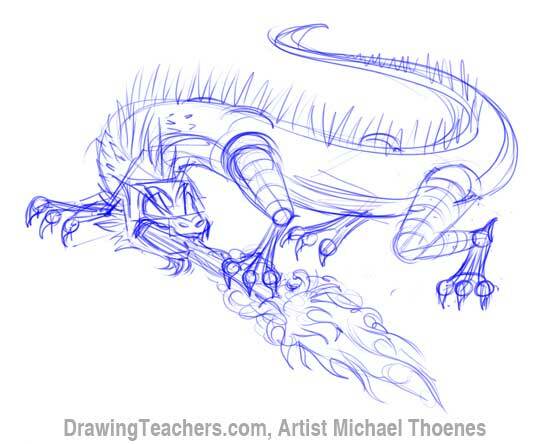 This fire breathing dragon is an advanced drawing lesson of a Chinese dragon styled creature with the body of lizard. 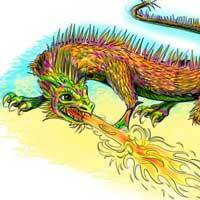 Draw dragon's fire blazing from his mouth. 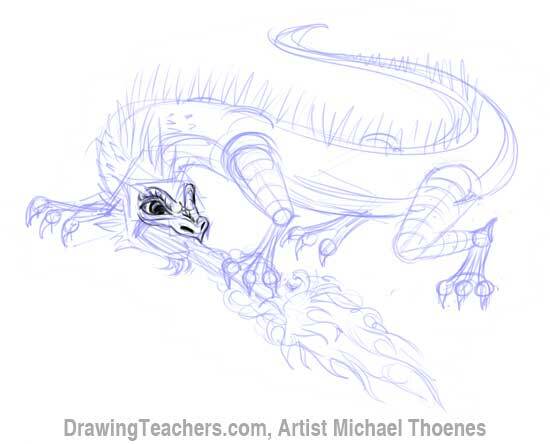 With strong legs and sharp claws, this dragon is covered with scales and spikes. He is ready to do battle to protect his lair. 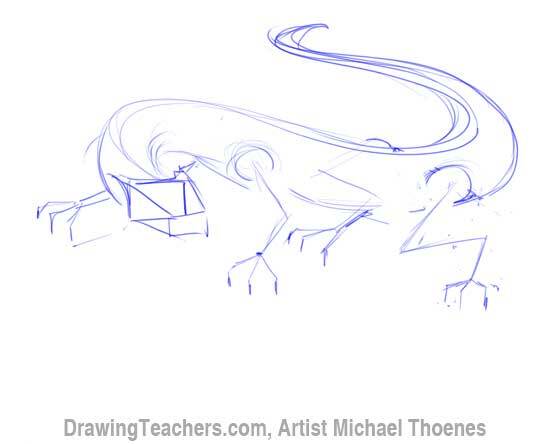 Begin your Dragon Lizard Drawing with a long s-shaped curve leading from the head to the tip of the tail. 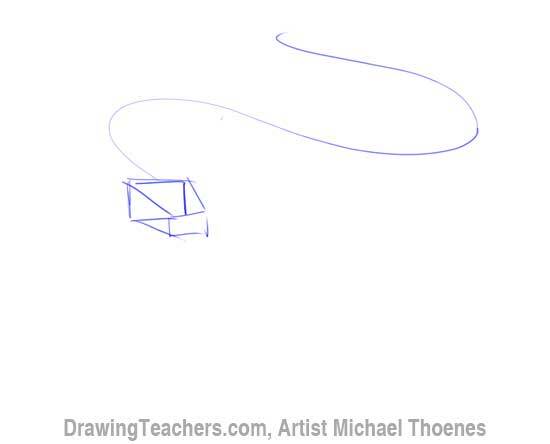 Draw a tapered 3D box to block in the head. 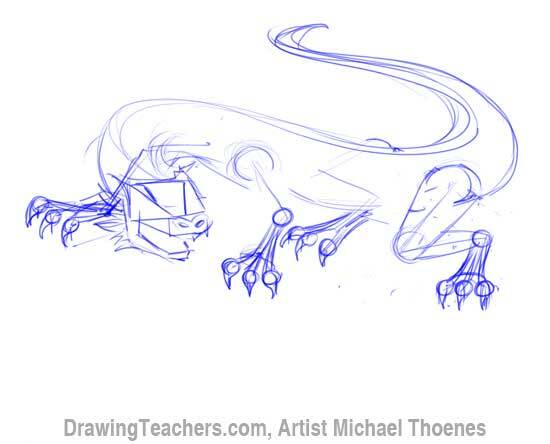 Sketch the shape of the dragons body and use lines to work out the structure and position of the legs and feet. Block in the lower jaw. 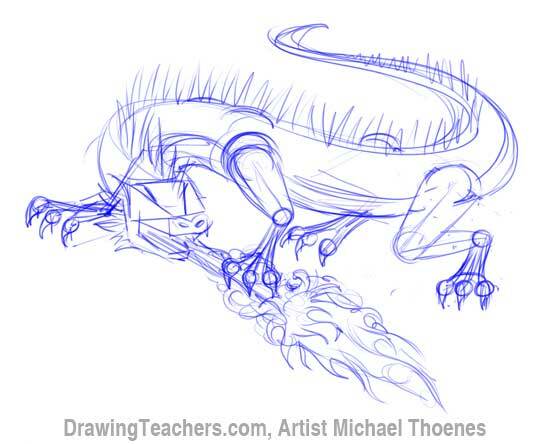 Add the dragon's toes and claws. 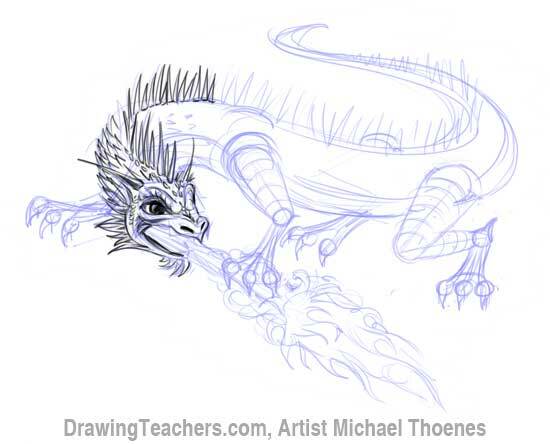 Sketch the structure of the feet, place the nostrils and begin to work on the dragon's mane. Block in the thighs. 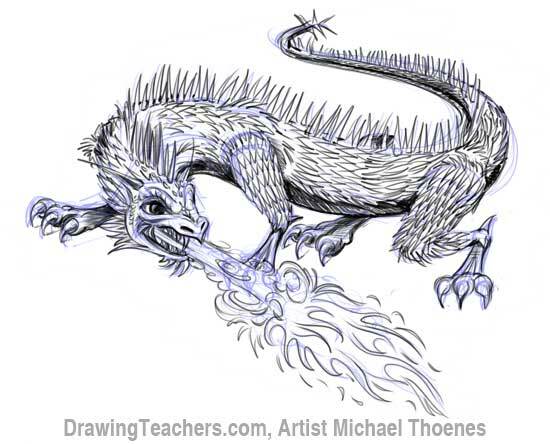 Sketch spikes form head to tail and sketch in a burst of flames blazing from the dragon's mouth. Contour rings on the legs help define the shape and placement of scales. On the head and neck, add the eye sockets and continue to work the mane and spikes along the neck just behind the head. Lighten your sketch with an eraser or us another sheet of paper to trace over your sketch. You can use a light table for this or even a window. Begin to ink the dragon starting at the head. 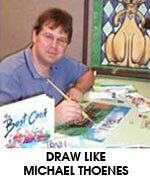 This is an opportunity to refine the structure and make another round of adjustments to your drawing. Continue working down the neck, carefully choose the angle and direction of your spikes to work along the curvature of the body. 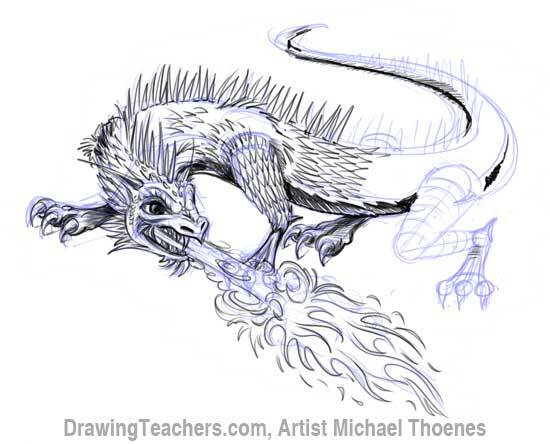 Ink the flames, the front legs and feet, and continue down towards the tail. Complete the inking by adding shading lines and more spikes. 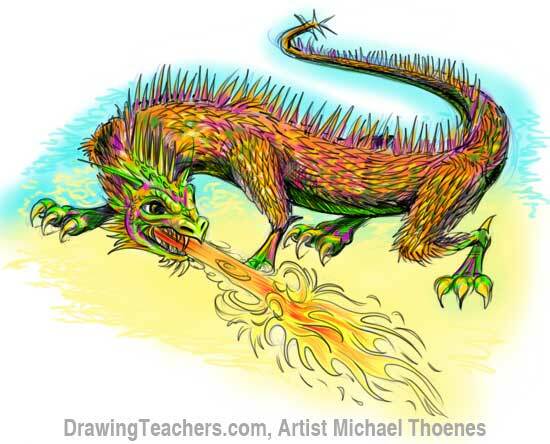 Paint or color your dragon with marker, crayon or colored pencil. 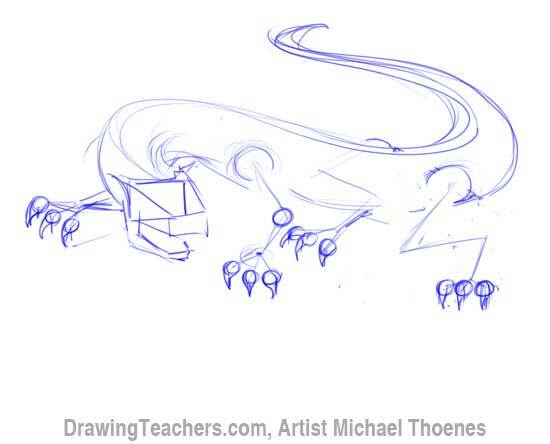 "How to Draw a Dragon Lizard!"